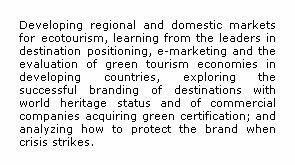 REFEREED PAPERS PARALLEL TRACKS (Academic Session) "Moving Up Ecotourism Along The Value Chain"
Application of Social Networking Mediums to Market/Promote Ecotourism. 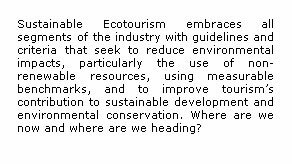 1) Use ecotourism to serve place (its preservation and maintenance), rather than using place to serve the tourism economy. 2) Build towns to benefit residents, rather than building towns to attract visitors. Evidence suggests that towns, which focus on building a healthy place for residents will ultimately attract high-value visitors who want to experience livable communities. 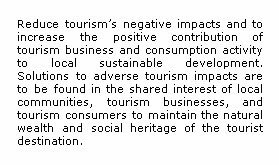 Conversely, towns that put too much emphasis on attracting tourists risk destroying place, and alienating residents. While ecotourism helps to support developing countries economic growth, the increasing demand for ecotourism experiences creates human-led pressure on fragile natural eco-systems. Developing regional and domestic markets for ecotourism, learning from the leaders in destination positioning, e-marketing and the evaluation of green tourism economies in developing countries, acquiring green certification; and analyzing how and where the ROI is achieved. Sustainable Tourism embraces all segments of the industry with guidelines and criteria that seek to reduce environmental impacts, particularly the use of non-renewable resources, using measurable benchmarks, and to improve tourism’s contribution to sustainable development and environmental conservation. Where are we now and where are we heading? What are the "real" and "hidden" impediments? Urban and Rural Ecotourism: New Paradigms? Theoretically, urban and rural ecotourism are at odds with the many accepted definitions of ecotourism. Should the scope of ecotourism be broadened to include nature-based attractions with high level of nature and pro-environmental interpretation and education directed at changing attitudes and values in urban areas which are cradles of civilisation? What are the challenges and opportunities ahead? Should urban ecotourism operations be included in ecotourism definitions? 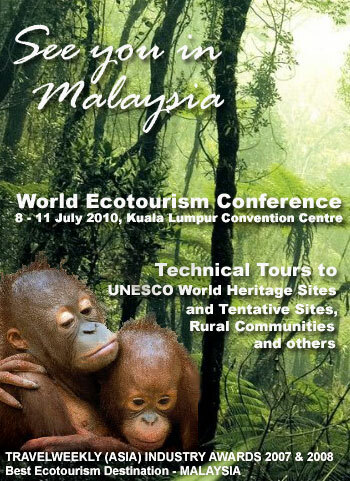 In recognition of the crucial role of academics and researchers in shaping the philosophy, theories, concepts and techniques associated with ecotourism, the Academic Session is aimed at showcasing and disseminating research findings that are focusing on moving up ecotourism along the value chain. It is widely acknowledged that ecotourism is relatively easy to develop as long as there is a will on the part of the government and/or private sector and local community as well as the availability of nature based resources. However, ensuring the long term viability or sustainability of ecotourism is a bigger challenge that requires sound planning and management. Central to the upscaling of ecotourism is the interface and integration between ecotourism, rural tourism and community based tourism. Scaling up ecotourism requires the community to be better empowered thorough advanced capacity building programmes so that local youths can have a promising career path and will not remain a menial worker in his own community based enterprise. 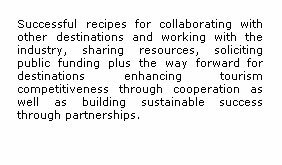 In the same light, community tourism ecotourism and/or rural projects should mature into smart partnerships with tour operators who have international networking, to be able to attract new market segments. Conversely such market segments are likely to demand better standards and service quality, hence upscaling of both the hard and soft infrastructure of ecotourism are essential.